Keep your family safe from mosquitoes with ultrasonic wave technology. Ultrasonic wave technology is safe for humans, very convenient and may be the easiest way to keep mosquitoes away. Mosquito away has a speaker generating ultrasonic wave and if you start the Mosquito away function, the speaker makes inaudible ultrasonic wave at a specific frequency of over 30kHz, completely harmless to human. The ultrasonic wave inactivates or repels mosquitoes. Mosquito Away technology is a convenient way to keep mosquitoes out of your room. The ultrasonic technology used the specific frequency of over 30KHz, completely harmless to human. IMPORTANT: Long term effect not tested and mosquitoes may become resistant. Mosquito species used in the test below may differ from the mosquito species of your region. This product is one of the ways to manage mosquitoes and not intended to replace other protective devices against mosquitoes. Tested by Intertek, Korea, according to LG internal testing method. Found to repel on average 72.5% of Aedes aegypti mosquitoes. Repel rate shows percentage of mosquitoes prevented from entering the inside chamber after 90 minutes of Treatment setting compared to Control setting. Represented average of 72.5% derived from 73.1%, 64.3%, 80.0%. Results may vary in other settings, including but not limited to temperature, humidity, location, space, mosquito species, number of mosquitoes, number of persons, and operation time. Due to the unstable infrastructure, the supply of electricity is usually lower than the demand. This is more frequent during the hot summer when the usage of electricity is high. 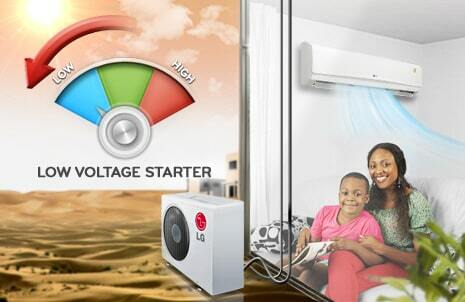 LG air conditioner even operates at lower voltage in lower temperatures. 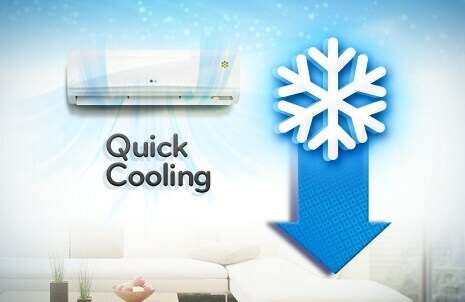 In jet cooling mode, strong air blows out, and the setting temperature automatically changes to 18°C for 30 minutes, and turns back to the original setting temperature after 30 minutes.